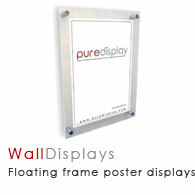 Our wall displays, available in varying dimensions, can bring you the visibility and footfall you are looking for. Whether you are looking for A6 Wall Mountable Poster Holders in Landscape or Portrait orientation, A4 Portrait Wall Mounted Rod Display Sets, A5 Portrait Wall Mounted Leaflet Dispensers, A4 Portrait Wall Mountable Poster Holders, Double Sided Self Adhesive Sticky Pads, 5 Sided Wall Mounted Acrylic Display Cubes or any other wall display, we can be of assistance. 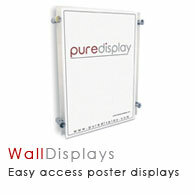 If you want to install poster holders, you can opt for our A4 Portrait Wall Mounted Rod Display Sets. Browse these categories under "Wall Displays"
Featured products under "Wall Displays"
Pure Display brings you a wide collection of some of the greatest display units to promote your business. We are a one-stop solution to advertise your merchandise or services to your target customers. 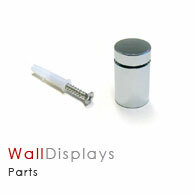 Our acrylic cubes are perfect wall displays for displaying delicate items to your target customers. With 5 sides covered and 1 side open for clear view, the 5 Sided Wall Mounted Acrylic Display Cube (285mm) can render you the perfect platform to promote your merchandise. We make sure that the products reach you on the expected date of delivery in a safe and sound condition. Our team of logistics experts keep in mind complete client satisfaction while packing and transporting the products. Browse our collection to choose the most appropriate wall displays as per your preference. Call us to get a detailed insight into the various types of shop fittings we offer or drop us an email stating your needs. Our experts will help you out in the best possible manner. Subscribe to our newsletter to stay updated about our most recent discounts and products.